How much is too much to pay for a piece of history? 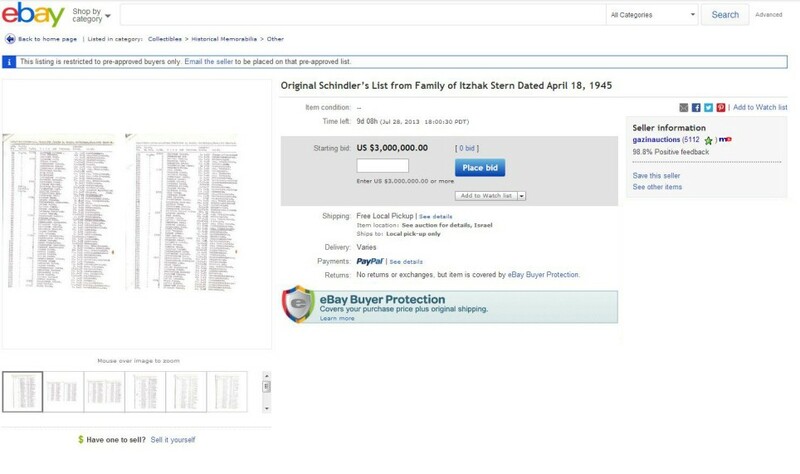 In the case of Oskar Schindler’s famed “list” the answer seems to be: three million dollars. That’s the minimum amount Gazin Auctions was expecting to receive when they put an original copy of fourteen-page list up for single-bid purchase on, of all places, Ebay. The list, forever immortalized in Steven Spielberg’s award winning film, features the names of over 800 Jewish males selected to work in the German industrialist’s factory, thereby saving them from near-certain death at the hands of the Nazis. According to the New York Post, the Israeli-based auction house had been hoping for an eventual five million dollar pay-day, starting with a $10,000 downpayment, and the remaining several million dollars due within a week. Instead, they got bupkes. Well, for starters, the Daily Mail points out that any successful bidder would have needed to travel to Israel to pick up their purchase “for security reasons.” Inconvenient, sure, but for someone dropping multiple millions on a piece of history, a quick jaunt to the Middle East doesn’t seem like too high a hurdle to clear. Instead, it seems as if the act of buying such an iconic item on as pedestrian a platform as Ebay was just too bitter a pill for most to swallow – especially, as The Daily Dot notes, many would prefer this list be given to a museum, as two of the remaining three original copies already are. Not only did Gazin fail to sell Schindler’s list. They failed to procure a single bid.